Yellow tsunami “hazard zone” signs, planted like sunflowers on street corners, guide our car along Iquique’s seafront. Inland, climbing the 800-metre-high cordillera that provides a backdrop to the city, the car slows to a crawl to ease past a section of highway that collapsed during the 8.2 magnitude earthquake in April 2014. Beyond Iquique the morning mist evaporates, the heat ramps up and the parched Atacama stretches away into the distance. This part of northern Chile is one of the driest and most inhospitable places on Earth; it is so otherworldly that NASA uses it to test its Mars exploration vehicles. Our view ahead is temporarily blurred as billowing clouds of dust fill the sky, the result of Chilean army tank exercises, my guide, Jaime, explains. Then, some 45km inland from Iquique, a strange sight appears ahead: in the middle of the desert plain sits the giant rusty skeleton of what looks like a marooned ship. Slowly other structures materialise: a set of train tracks, clusters of huts and warehouses, and finally neat rows of houses and dusty streets. There is not a person in sight. 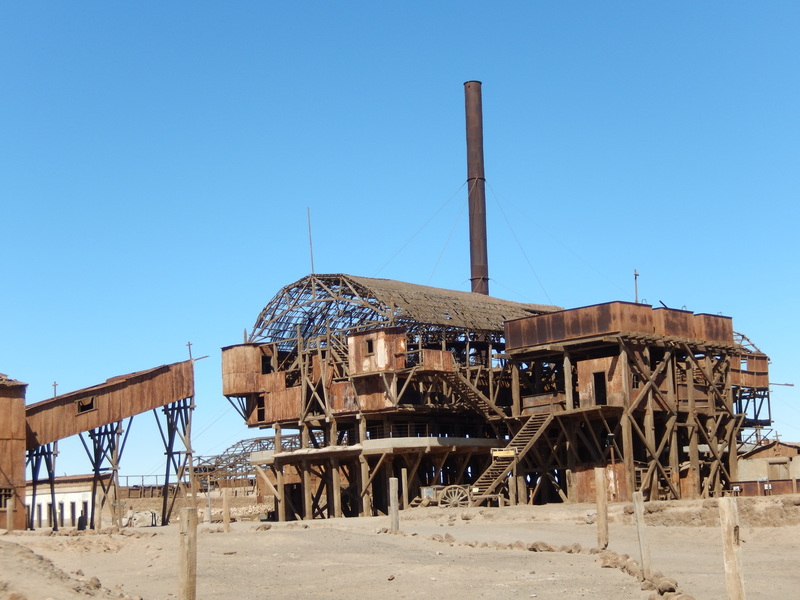 This ghost town, Santa Laura, is one of the remnants of a largely-forgotten industry that once made the Atacama Desert one of the most valuable places in the world. In the nineteenth century, the vast saltpetre (potassium nitrate) deposits in the region – then part of Peru and Bolivia – were heavily in demand for use as fertiliser and gunpowder in Europe and North America. A booming industry developed, with rapacious nitrate barons – many of them British – using the hefty profits to build opulent mansions in cities like Iquique. In 1878 the War of the Pacific broke out between Chile, and Peru and Bolivia: five years later, Chile emerged victorious, having seized all of the nitrate territories. Of the 200 or so oficinas salitreras (saltpetre works) that operated during the industry’s heyday, only one – María Elena – still operates. The rest have disappeared, stripped clean of anything valuable and eventually swallowed by the desert after World War One signalled the beginning of the end of the nitrate boom. But for a quirk of fate Santa Laura and neighbouring Humberstone would have suffered the same. Today, Santa Laura, which opened in 1872, is an adventure park for anyone interested in industrial archeology. Jaime and I arrive early in the morning and have the eerie site to ourselves. At its height the oficina was home to over 870 inhabitants: workers lived with their family and for much of the plant’s history were treated appallingly. They worked long hours, in harsh conditions, paid in “tokens” redeemable only in the oficina’s shops, and dissent met by repression or even massacre. Wandering around Santa Laura, kicking up clumps of crumbly white caliche (unrefined saltpetre), we discover a treasure trove of Victorian-era technology: the remains of a railway station and train carriages; a factory with metal-cutting machines, coolers and compressors; and a power station with a gas engine made in Halifax and steel beams from Lanarkshire in the UK. Preserved in the dry desert air, most of the machines look as if they’re still in working order. The “marooned ship” proves actually to be a leaching plant, its mast a smokestack. The rusted corrugated iron walls – one of them pierced by several bullet holes – creak and groan in the wind. There is still a distinct smell of iodine (a by-product of the saltpetre process) giving the sense that you are in some kind of steampunk hospital. A couple of kilometres away is the larger and more extensively restored Humberstone. It was taken over by the Chilean government, who in 1932 named it after British nitrate entrepreneur James “Santiago” Humberstone. At its height the town had a population of some 3500 people: “Though it had the capacity for twice that number. The industry was collapsing in the 1930s and the government just wanted to give people jobs,” says Jaime. 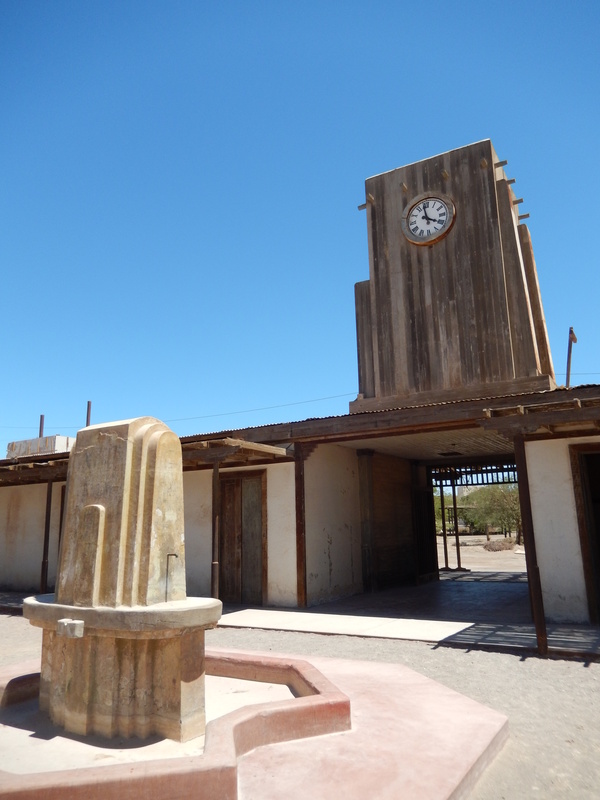 Much of the architecture is Art Deco, giving Humberstone the vague feel of west coast, small-town Americana, and many of the workers’ homes have been turned into mini museums. One of the most evocative is filled with letters that sheds light on day-to-day life: one reveals a “strike” by housewives who were refusing to cook for their husbands until they received a better quality charcoal for the ovens; another complained about the cost of building a new tennis court. In the town centre, the surviving facilities show that by the 1920s and 30s, conditions had slowly improved. There is a large, empty swimming pool, complete with diving board; a school filled with wooden desks and (sometimes risqué) graffiti; and a town clock stuck permanently at 4pm. Overlooking the town square is the old hotel, with guest rooms, a restaurant, bar, billiards room, and a separate entrance at the back for workers, who were forbidden from using the front door. Conditions may have improved, but a strict hierarchy continued in the oficinas. These slowly crumbling buildings provide a sense that the hostile Atacama had been tamed – but a five-minute walk away to the industrial area reminds you of the harshness of the environment. It is blisteringly hot, shade free, and the wind whips past, covering us in a sheen of dust and grime. Beyond the factories and warehouses, a solitary train engine faces out towards the desert. Humberstone’s highlight, though, is its glorious (and supposedly haunted) theatre. Inside, perched on a wooden seat, it is strangely quiet, as if a performance had only just ended. I travelled with Journey Latin America, who offer a seven-night trip to Santiago, Iquique, the ghost towns and San Pedro de Atacama from £2549 per person (including transfers, B&B accommodation, excursions, and all flights). A version of this article was first published here.